Bailouts and Austerity Measures Aren't Working: Is This the Euro's Last Stand? Will Italy's Economic Crisis Mean Endgame for the Euro? Should Greece Ditch the Euro? Who has time for pleasantries when the fate of Europe and the global economy is at stake? After Mario Monti, an economist with little experience in the rough world of Italian politics, was sworn in as the country's new Prime Minister on Nov. 16, German Chancellor Angela Merkel sent him a congratulatory letter that minced no words. With Italy, the euro zone's third largest economy, gripped in a debt crisis, Europe was counting on him to repair his country and save the euro from disaster. "There are many hopes and expectations set on you," she wrote. "It would behoove you and your government to decide upon and implement decisive and significant reforms." Monti is committed to doing his best. On Nov. 17, he told Italy's Senate he'd slice the national budget and introduce progrowth reforms. "We can't be considered the weak link of Europe," Monti warned. But even if Monti lives up to his nickname  Super Mario  the crisis roiling the euro zone has become far too big for Monti, or even Italy, to solve on their own. What Monti needs most of all wasn't mentioned in Merkel's letter  much greater cooperation among the members of the monetary union and significant changes to the euro zone. The only way to save the euro is to forge a renewed monetary union based on much deeper integration. "There is no way around it, if we want to avoid the euro breaking apart," says Sigmar Gabriel, the chairman of Germany's Social Democratic Party. Virtually everyone in Europe, if not the world, agrees. 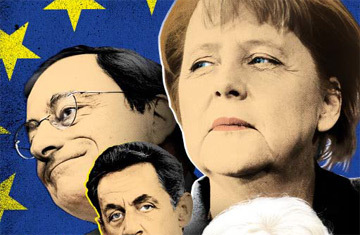 At their many conferences and summits throughout the two-year debt crisis, Europe's leaders have routinely insisted that further coordination is the best solution. "We are indeed now facing a truly systemic crisis that requires an even stronger commitment from all," José Manuel Barroso, president of the European Commission, said on Nov. 16. Merkel expresses similar sentiments. As Italy tumbled into crisis, she called for "more Europe, not less Europe" to protect the euro. But "more Europe" has come slowly and grudgingly, and crucially, there is no consensus among the zone's varied members on what, exactly, "more Europe" means or how to bring that goal to fruition. Many insist that euro-zone countries must inevitably give up more autonomy over national policies and take greater responsibility for the problems of their fellow members. But others, particularly in Germany and other more stable countries, don't necessarily see things that way, and have been reluctant to take drastic steps. As a result, a continent-wide wrestling match has broken out over who should bear the burden of rescuing the euro and what that critical balance between state and union should be. How much money and sovereignty should nations sacrifice for the greater good? The survival of the euro, and the dream of a peaceful, united Europe it symbolizes, may depend on that question. What's paralyzing Europe is a flaw buried deep within the monetary union's structure  the unresolved conflict between the needs of the euro and the independence of its members. When the euro launched in 1999, critics pointed out that the monetary union was, in fact, only half a union, and thus susceptible to failure. The 11 original members surrendered their national currencies and control over monetary policy to the European Central Bank (ECB) but retained their power to tax, spend and borrow. With no overarching political authority, the individual states of the zone could easily march off in vastly different economic directions, tearing the monetary union apart. To prevent that from happening, all members were supposed to adhere to rules to keep their financial positions roughly the same. Budget deficits weren't to exceed 3% of GDP, and government debt 60%. That didn't work. Few members followed the rules strictly. (Even austere Germany violated deficit limits.) As more countries joined the union  there are now 17  the inequalities between their economies grew. Some, such as Greece and Portugal, used the luster of euro-zone membership to borrow at lower interest rates than they could have received otherwise, building up ever higher mountains of debt. Meanwhile, a core of more disciplined countries, led by Germany, controlled spending, reformed their economies and became more competitive in global markets. This schism went unchecked. Twelve years after its founding, there were in fact two euro zones  one of relatively healthy, competitive economies, mainly in the north, and another of slow-growth, indebted, uncompetitive countries, primarily in the south. Instead of fostering a greater convergence of Europe's economies, the euro had brought about dangerous divergence. All those years of avoiding these problems exploded in late 2009, when Greece first toppled into a debt crisis. The euro zone tried to stanch the problem with a $150 billion bailout for the country in May 2010, but with investors aware that Greece was just the first of several countries with potentially unsustainable debts coming due, that did nothing to squelch the contagion. By this summer, Ireland and Portugal had collapsed into bailouts as well, while Italy and Spain, both core members of the union, were at risk of default. The leaders of the euro zone have pressured these countries into gut-wrenching austerity and reform programs to stabilize debt levels and cut deficits, hoping such reforms could fix their finances, rebuild investor confidence and save the euro. That strategy has failed. Investors aren't convinced Europe's politicians have the will, ability or political clout to push through such excruciating fiscal adjustments, at least not in any reasonable period of time. Research firm Capital Economics figures that even with reform, Italy will still need two decades to get its government debt level down to a more sustainable 100% of GDP from 120% today. The severe budget cuts Greece, Spain and Portugal have enacted have dampened growth, making the process of raising revenue and closing deficits even more difficult, all while generating widespread public resentment. Meanwhile, assistance from the rest of the zone has been offered reluctantly. The euro zone formed a $1 trillion rescue fund called the European Financial Stability Facility (EFSF), backed in part by guarantees from its members, to provide emergency bailouts while troubled economies mend their ways. But as the crisis has spread to giants like Italy, the EFSF has become too small to be a credible euro defender. Euro-zone leaders, fearful of exposing their taxpayers to further potential losses, have resisted enlarging it. Instead, they've gone begging to China and other emerging economies, hoping to woo them into donating cash. Other euro-zone agreements have also drifted. A second bailout of Greece, approved in July, has been held up by political bickering, while a plan to boost the firepower of the EFSF has faltered. Frustration with this lack of action is building. "Where is the implementation of these long-standing decisions?" asked ECB President Mario Draghi in a Nov. 18 speech. See the details of Europe's new debt-crisis agreement. See TIME's photo-essay "Outrage in Athens."